Earlier today Robert Iger announced that Star Wars: Galaxy’s Edge would open in Walt Disney World in late August. However, not all of the new land will be open on that date! 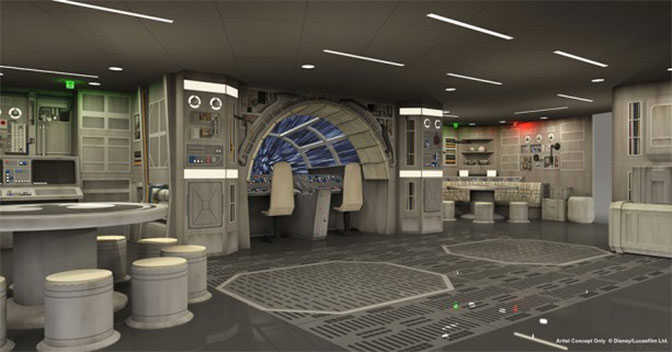 Millenium Falcon: Smuggler’s Run WILL be open on August 29, 2019. However, Rise of the Resistence will NOT be open on that date. It will open at a later, unannounced date. Fastpass service will NOT be initially offered for Millenium Falcon: Smuggler’s Run. The grand opening in Disneyland will offer both attractions on opening day of May 31, 2019. Hopefully that will make May less crowded! Yay! I am planning to go the last week in August. I thought I would be missing the Star Wars opening. Do you think the whole week is now going to get much busier, or can I just avoid HS from the 29th forward and be ok. I already made dining reservations so I really don’t want to move my trip, but if the crowds are going to be significantly higher I might want to go a week earlier. Any thoughts on best plan of attack if we want to see it? We leave on August 30th so only have August 29th and maybe a few hours in the park on the 30th before having to be at POP by 3pm to catch the Magic Express to airport and fly home. Kenny, will you be updating the crowd calendar at all? I know you usually stick with what you’ve predicted, but I’m guessing this announcement changes things. We arrive August 28th and I honestly think I might change my dates to July to miss this madness. I booked free dinning and I dont want to give it up unless the opening is going to make all the parks crazy busy. Do you think this will reduce crowds for June-August now that there is an announced date? My understanding is that Resistance will not be opening on May 31, 2019 when the rest of the park does. It is delayed there also. Just imagine what the Universal team is thinking right now. Their new Potter ride opens in June and they thought they would have until winter before Star Wars mania swept into Orlando! Our reservations are Sept 6 – 14… no FastPass+ for the new ride is a bummer. Are there any table dining restaurants? Universal isnt worried. They are just as busy as Disney and the way the prices at Disney are soaring I can see a lot more people choosing Universal over Disney. I’m disappointed by the announcement. I booked Sept 13-22 hoping to miss the Star Wars madness and now I’m going to be in the middle of it. Kenny, I need to book dining reservations in 10 days, how soon to you update the September crowd calendars factoring in this info? Would love to know this also…as I too was hoping to miss the madness and will now be in the middle of it. Here’s to hoping people will wait until it is all open to visit! Ugh we were actually hoping to avoid the opening. It’s going to be so packed now…. There was a lot of talk about ROR software not cooperating, and this looks to be proof of it. I’m still adding max pass to the reservation I made for first week of june, just in case they decide to change their minds on that. Booked at pop thinking the gondolas might be up and running by September, – heres to hoping! This is incorrect. It’s only the Disneyland version that will be opening in phases. Do you think most people will wait until the second phase of Star Wars Land is open before they visit Hollywood Studios? Will Disneyland have Fastpass Service with Maxpass as an option for both rides when they open in May? Wow just made reservations for Aug 30 , son’s 13th dbay, and make Halloween party before pins etc are sold out. Last year most all was gone when went in Oct. Doing 2 days HW. Think HW will offer extra hrs. Everyday for a while??? Get you souvenirs you want early in your night. They only a lot so many per party. They wouldn’t sell pins to me even though they had some. Very excited! Glad I already have our room booked,too.